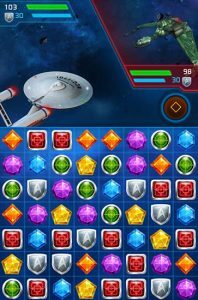 Star Trek Wrath of Gems is a downloadable game for most devices (I play it on my Kindle and I know the Skipper plays it on his phone). Play is fairly straight forward and is similar to most of the gem or tile matching games that I’ve played – match three, four or five of the same gems and something happens. 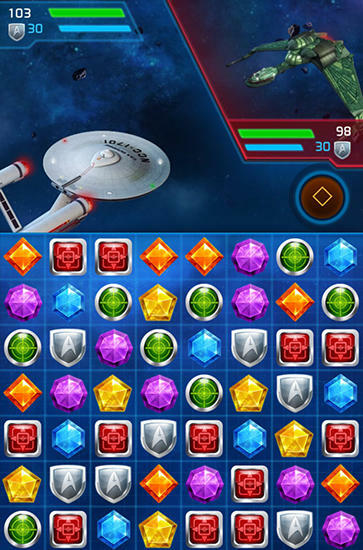 The game itself has three basic modes and follows The Original Series (TOS) and The Next Generation (TNG). The first mode is story mode where you play out a set story line in either the TOS or TNG universe – there is no time limit so you can play this mode whenever you like. The next mode is the event mode where you play out another set story line but have between two and three levels of difficulty to choose from (easy, normal, and difficult). In event mode you have a set amount of time to complete the story line normally limited to one to two weeks. Along the way you collect various characters and ships that you have the ability to upgrade levels and special abilities while you play. You also collect dilithium crystals and coins that you use in order to “purchase” the upgrades. These first two modes are strictly player versus the computer. The final mode of play is the arena where you take on characters and ships of other people that are also playing the game – this also has a time limit of one or two weeks. Note that you don’t actually take on the individuals live but whatever level and abilities the individual has set up for their various characters and ships is what you will face. In event mode the more people you defeat, the higher you will rank, at the end of the time limit your rank will determine what bonus items you receive. I’ve been playing this game for a little over two months and have found that my preference tends towards the events. The Skipper (who got me interested in this game) however prefers to do battle in the arena. 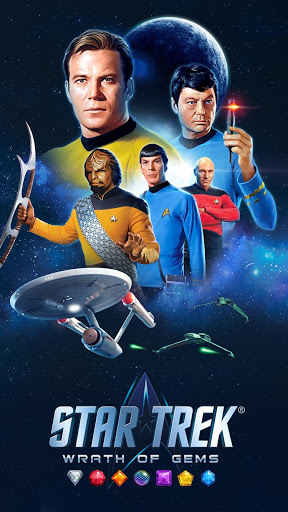 I don’t think its the greatest game out there but if you’re looking for a Star Trek fix (as I was when I started) it may grab your attention and not let go.